The DJ has the Bride & Groom face opposite direction on the dance floor, then has men line up on the brides side and women line up on the grooms side. 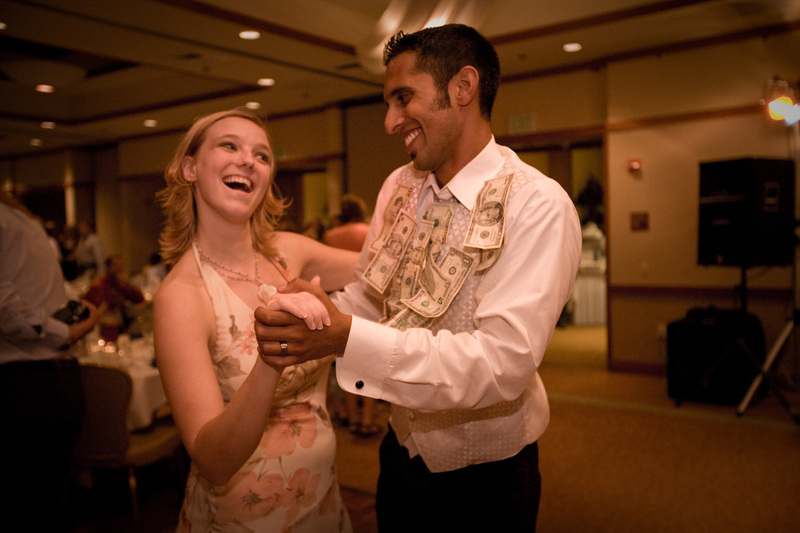 This can be a fun way to interact with your guest and make a little money for your honeymoon! The DJ will have all of the married couples come out to the dance floor. A slow song is usually the best to help set the mood. While couples are dancing the DJ will begin to eliminate couples from the dance floor starting with the couple married for the shortest amount of time, this usually being the Bride & Groom. The DJ will continue eliminating everyone until the couple that has been married for the longest amount of years are the last ones on the dance floor. It is customary that the last couple receive a bouquet of flowers or small gift. The Anniversary Dance can sometimes replace the bouquet toss if you choose. The DJ will set two chairs back to back and then seat the Bride and Groom facing away from each other, then ask them to each remove their shoes and hand the other one shoe. The DJ will ask a series of questions, the Bride and Groom will answer with a raise of the appropriate shoe. Example, DJ asks "Who is in charge of the remote control"? The Bride and Groom answer by raising the appropriate shoe for the answer. This is a great game to get some serious laughs from your guests and get everyone involved. We have some really fun questions for this game! The object of this game is to have the Bride plant as many chocolate kisses that she can (wherever she wants) in the Grooms pockets, hands, etc. You will have a lot of cheering and direction from the guest of course! The DJ will then ask your guests to guess how many kisses the Bride planted on the Groom. After they have counted them, the person who guesses the closet number wins a dance with their choosing with the Bride or Groom. You can also exchange the dance with a small prize. Provide guests at each table with index cards and pencils. Their task: to come up with the best marriage advice they can give for the newlyweds. After the toast is finished have someone collect them and have the DJ read them. Award gifts or a dance for "The funniest advice given", and "The best advice given". Choose a winner by laughs or applause!